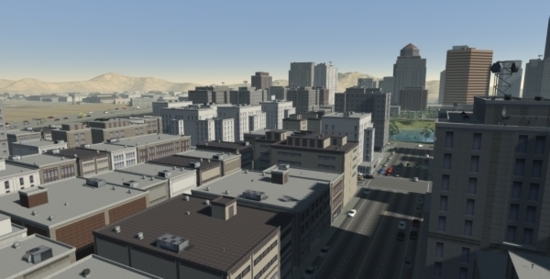 CityScape is an urban modeling tool that allows users to build both custom and real-world environments quickly and easily. The focus of the modeler is on allowing developers to focus on design rather than the labor involved in creation. CityScape's focus allows it to product environments 10x faster than traditional object modeling tools or scene editors. Roads: Instantly create complex road networks with freeways, interchanges, bridges, overpasses, on/off-ramps, and cul-de-sacs. Props: Manually populate cities with buildings, trees, power lines, and custom imported props, or automatically in a single click. Making modifications after construction is complete is as simple as drag-and-drop. Terrain geometry, road networks, and props adjust to changes naturally. Automatic Generation of Traffic Data: Traffic data is procedurally generated with the road network and automatically updates whenever the network is modified. Supports Popular File Formats: 3ds Max, Maya, COLLADA, GameBryo, OpenFlight, and Elevation Data. Multi-User Support: Teams can work on different portions of the same region simultaneously while CityScape merges changes and manages the master plan automatically.